Nearly every driver has engaged in some form of distracted driving at one time or another. A quick text response, turning around to speak to a passenger—any action that takes focus off the wheel has the potential to cause severe injuries. Distracted driving causes thousands of deaths and hundreds of thousands of accidents every year, and the risk of these crashes is especially high in Tennessee. “Distracted driving” is often used as a synonym for using a cellphone behind the wheel. However, the truth is that a driver can be considered distracted if he or she is engaging in any non-driving activity. Visual distractions take the driver’s eyes off the road, manual distractions require a driver’s hands to leave the wheel, and cognitive distractions pull a driver’s focus away from driving. Talking on the phone. A recent study performed by the National Safety Council found that Tennessee leads the nation in cellphone-related car crash deaths. Tennessee saw 71 fatal crashes involving drivers on cell phones in 2010, a number that increased to 93 the following year. On average, one in ten Tennessee traffic crashes that ends in death involves some form of cellphone distraction—a figure that is ten times higher than the national average. Texting. Texting has been called the biggest and most dangerous distraction to drivers, requiring a driver’s hands, eyes, and concentration. In the time it takes for a driver to read just one text message, a car going 55 mph can travel the entire length of a football field. Like many states, Tennessee texting laws allow a police officer to pull a driver over for texting, and novice drivers caught texting may lose their ability to get a graduated license. However, penalties for texting violations do not increase with each offense, allowing repeat offenders to get back on the roads after paying a fine. Eating or drinking. Eating while driving is a common action for many drivers, most of whom do not realize just how distracting it can be. From a hot cup of coffee in the morning to grabbing some drive-through on a road trip, the act of eating or drinking behind the wheel can prove deadly for road users. 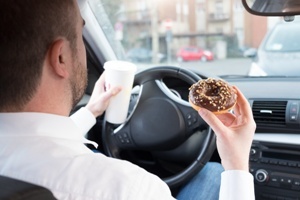 At a minimum, eating or drinking requires occasional concentration and at least one hand to leave the wheel—and the distractions multiply if the driver spills hot coffee or drops food on himself. Fiddling with radio or GPS. Many new car models have full entertainment systems, navigation assistance, and phone integration that can be controlled with voice commands. This may allow the driver to control the radio and make calls hands-free, but these innovations still require a great deal of the driver’s concentration (and some are more distracting than the technology they are meant to replace). Talking to people in your vehicle. Cell phones are not the only way talking while driving can be dangerous. Riding with passengers helps to pass the time and make driving easier, but each person in the car is a potential distraction. Children needing a parent’s help, teenage friends engaging in horseplay, and even a passenger who begins a heated argument can all distract the driver to a dangerous level. How Can I Tell If a Distracted Driver Caused My Car Accident? As many as 14% of all reported motor vehicle accidents in 2015 were categorized as distraction-related crashes, a number that has been steadily increasing. If you have been injured in a car accident, we can investigate a driver’s cellphone records, common driving activities, and other potential evidence to rule out distracted driving, getting you the compensation you need for your injury costs, loss of income, property damage, and pain and suffering. Fill out the quick contact form on this page to have the attorneys at GriffithLaw explain your rights in your free case evaluation, or order a free copy of our book, The 10 Worst Mistakes You Can Make With Your Tennessee Injury Case.